Home / Editor's Choice, Entertainment News, Forum and discussion, Gossip and Drama, Lifestyle / Slain Moi University Medical student IVY WANGECI scored a straight A in KCSE from a top National School. Slain Moi University Medical student IVY WANGECI scored a straight A in KCSE from a top National School. 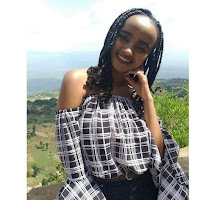 Wednesday, April 10, 2019- Ivy Wangeci, the slain Moi University medical student was a bright student who passed her Kenya Certificate of Secondary Education (KCSE) with flying colors. Ivy was among top students at Alliance Girls class of 2012 that saw her admitted at Moi University Med School and she was to graduate this year. However, her life was cut short yesterday when a man identified as Naftali Kinuthia hacked her to death in broad daylight at Moi Teaching and Referral Hospital. While people are speculating over what drove the middle aged man to commit such a heinous act, the motive behind the macabre murder is yet known. Meanwhile, Moi University School of Medicine Dean Dr. Lukoye Atwoli has paid tribute to Ivy describing her as a hardworking student. “All the students’ academic results are confidential. We normally rate our students as either pass or fail and Wangechi was doing well,” said Prof Atwoli. On the same breath, he urged people to stop spreading lies about her requesting them to be considerate to the family and her friends. “I will like to tell people who are writing and sharing these lies about her to stop. We are urging people to be sensitive to her family, her friends and those close to her,” Prof Atwoli added. Meanwhile, the monster behind Ivy’s death is currently receiving treatment at Moi Teaching and Referral Hospital under tight security after he was nearly lynched. He will be arraigned in court to answer to murder charges once he is able to talk.